FAYETTEVILLE, Ark. 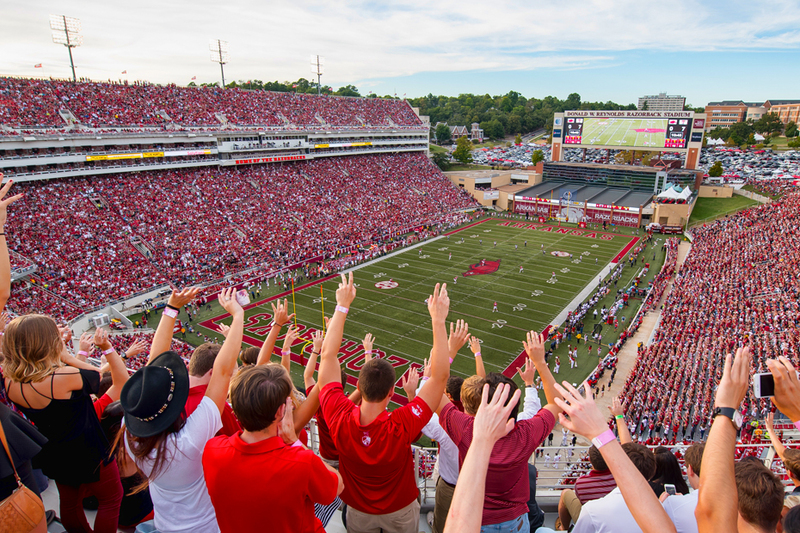 – For the first time in school history, the University of Arkansas will play four Southeastern Conference games at Donald W. Reynolds Razorback Stadium in the 2016 season. Arkansas and the SEC announced the full 2016 Razorback Football schedule Thursday night during a special edition of SEC Now on the SEC Network. The four SEC games in Fayetteville are against some of the nation’s top programs as Alabama (Oct. 8), Ole Miss (Oct. 15), Florida (Nov. 5) and LSU (Nov. 12) will make trips to Razorback Stadium. Those teams have totaled 24 national championships, while three of the four have won a national championship in the past 10 years. The group has won seven of the past nine SEC titles and all are currently ranked in the top 20. Arkansas’ non-conference schedule is highlighted by a trip to current-No. 5 TCU on Sept. 10. It will be the first time the Razorbacks have played TCU since both schools were members of the Southwest Conference in 1991. TCU will return the home-and-home to Fayetteville in 2017. The Razorbacks will play the Southwest Classic on Sept. 24 at AT&T Stadium in Arlington, Texas and will have SEC road games at Auburn (Oct. 22), Mississippi State (Nov. 19) and Missouri (Nov. 26). Arkansas opens the season against Louisiana Tech on Sept. 3. Other non-conference games include Texas State on Sept. 17 and Alcorn State on Oct. 1 in Little Rock. Sept. 3 Louisiana Tech TBA Fayetteville, Ark. Sept. 10 at TCU TBA Fort Worth, Tex. Sept. 17 Texas State TBA Fayetteville, Ark. Oct. 1 Alcorn State TBA Little Rock, Ark. Oct. 8 Alabama TBA Fayetteville, Ark. Oct. 15 Ole Miss TBA Fayetteville, Ark. Oct. 22 at Auburn TBA Auburn, Ala.
Nov. 5 Florida TBA Fayetteville, Ark. Nov. 12 LSU TBA Fayetteville, Ark. Nov. 19 at Mississippi State TBA Starkville, Miss. Nov. 26 at Missouri TBA Columbia, Mo. Fans looking to purchase new season tickets for the 2016 season can place a deposit at ArkansasRazorbacks.com. Current season ticket holders will have the opportunity to renew their season tickets in February 2016. The Razorbacks have won all three meetings against the Bulldogs with next year’s game being the first since 1997. Louisiana Tech currently leads the Conference USA West Division at 5-3 overall and 3-1 in conference play. The Bulldogs are averaging nearly 38 points per game behind senior quarterback Jeff Driskel, a transfer from Florida. Two of their three losses this season have come to Power 5 schools (Kansas State and Mississippi State). Louisiana Tech finished 9-5 and beat Illinois in the Heart of Dallas Bowl last year. After finishing a home-and-home with Texas Tech, the Razorbacks will renew another former Southwest Conference rivalry with TCU. The first meeting will be on Sept. 10, 2016 in Fort Worth, Texas where the current-No. 5 Horned Frogs have won 10 consecutive home games dating back to the 2013 season. Head coach Gary Patterson boasts a 71-14 all-time home record at TCU and the Horned Frogs have won 19 of their past 20 games overall. The Sept. 10 meeting will be the first between the two teams since Arkansas joined the SEC in 1992. The Texas State Bobcats are led by the third winningest active coach in FBS football, Dennis Franchione. In his 30th season as head coach, Franchione led the Bobcats to a 7-5 record last year despite putting in new offensive and defensive systems. Franchione was 2-1 against Arkansas as the Alabama head coach from 2000-2002. Texas State is 2-4 this year and 1-1 in Sun Belt Conference play. The Southwest Classic returns to AT&T Stadium for the third consecutive year after the two schools played a home-and-home series when Texas A&M first joined the SEC in 2012. The Aggies have won both conference meetings in Arlington but needed overtime in both to do so. Despite racing to a 5-0 start and a top 10 ranking, Texas A&M has dropped its past two games against Alabama and Ole Miss. The Braves currently lead the Southwestern Athletic Conference’s East Division with a 3-1 mark in conference play and 4-2 record overall. Alcorn State is 4-1 against FCS opponents this season, with its lone loss coming in a 35-34 heartbreaker against Grambling State last week. The Braves have allowed 14 points or less in four of their five FCS games. Alcorn State has never played Arkansas. The Braves won the 2014 Black College Football National Championship for the first time in 30 years with a 10-3 overall record. The football program has produced NFL greats such as Steve McNair and Donald Driver. Arkansas has dropped nine in a row to the Crimson Tide but have come awfully close to ending the streak in the past two meetings. The Razorbacks fell by just one point, 14-13, in 2014 at Donald W. Reynolds Razorback Stadium and led Alabama late in the third quarter this season in Tuscaloosa. Alabama is currently No. 7 in the nation at 7-1 overall and won national championships in 2009, 2011 and 2012. The Razorbacks stunned No. 8 Ole Miss last season, shutting the Rebels out 30-0 in Fayetteville. Arkansas has won three of the past five meetings and hold a 33-27-1 edge in the all-time series. Ole Miss continues to compete for the SEC West crown and is off to a solid start in 2015. They sit at 6-2 overall with a 3-1 mark in SEC play and an impressive 43-37 win at Alabama. Arkansas meets the Rebels in two weeks on Nov. 7 this year. Auburn has had quite the run over the past five years, winning two SEC titles, the 2010 national championship, and playing for another national title in 2013. However, the Razorbacks have had success at Auburn, winning three of the past five meetings at Jordan-Hare Stadium. Arkansas outlasted Auburn last week in Fayetteville, posting a 54-46 win in quadruple overtime. It has been a long time since the Gators have played in Arkansas. The last meeting in the Natural State came in 2008 when Tim Tebow was the Gators’ quarterback and rolled to a 38-7 victory over the Razorbacks. In fact, Florida has played at Arkansas just three times in program history. The Gators are expected to come into next season with a lot of momentum as they lead the SEC East and are ranked No. 11 in their first season under new head coach Jim McElwain. The Battle for the Boot will take place on Nov. 12 next year in Fayetteville. Last season, head coach Bret Bielema picked up his first SEC win by shutting out No. 20 LSU emphatically, taking the boot home with a 17-0 victory. The two schools will play again for the trophy in a few weeks on Nov. 14 down in Baton Rouge, La. LSU is the only unbeaten team remaining in the SEC, ranking No. 4 nationally atop the SEC West. Arkansas will close the 2016 season with back-to-back away games and begin that road swing in Starkville, Miss. on Nov. 19. The Razorbacks had a chance to take down the No. 1 Bulldogs last year at Davis Wade Stadium, but Mississippi State was able to take a fourth-quarter lead and hang on for the 17-10 victory. The Bulldogs will have to replace first team All-SEC senior quarterback Dak Prescott next year, but a stout defense and plenty of cowbells will make playing in Starkville a headache. For the third consecutive year, Arkansas will finish the regular season with the Battle Line Rivalry against Missouri. The Razorbacks couldn’t hold on to a 14-6 lead last season in Columbia, eventually dropping the game 21-14. Junior quarterback Maty Mauk is expected to return this weekend, but will likely play his final home game next year when the Razorbacks arrive at Faurot Field during Thanksgiving weekend.